Vibram, the Italian shoe company famous for its Fivefingers shoes and Megagrip soles, has released news on its first shoe prototype that is able to convert and use energy to charge your mobile phone. The shoe's technology has been developed exclusively by Vibram, which has worked with the IIT (Italian Institute of Technology), the Centre for Micro-BioRobotics in Pontedera (PI, Italy) and with InStep NanoPower, a US company that specializes in nanotechnology and renewable energy. Together they have helped to develop a shoe which can store and convert the energy produced from movement, in this case walking, and use it to charge various devices including a mobiile phone. The shoe works with an integrated system in the midsole of the shoe which converts the energy to power an internal electronic device. Walking at a standard speed generates on average 1 watt of energy, with 8 hours of walking enough to charge your smartphone and prevent it from dying on you while out and about. The power generated is also affected by the weight of the user, his or her walking speed, and the load carried. Walk faster, and you'll generate more energy. The system also self-powers an electronic chip which uses Bluetooth to communicate with a special Android application to send users information on their walking, including number of steps, foot temperature, and geolocation, as well as information on that all important battery level to make sure you stay connected to the world via your smartphone. And, in addition to charging up your phone, there is even a micro USB port on the shoe which can use the system's stored energy to charge external devices. Vibram believes that the shoe's charging abilities have more far-reaching implications than simply powering up your smartphone. This power reserve -- combined with the system's continuous geolocation abilities -- could help emergency teams, such as firemen and special forces. 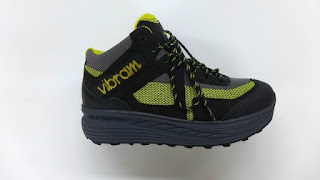 Vibram also believes the system could possibly use the stored energy to produce heat, something that could be of benefit to users in harsh, inclement weather conditions. Vibram presented its first smart shoe back in 2015. A collaboration between Vibram and Chinese tech company Lenovo, the shoe used a GPS-powered navigation system which recorded data from the users which could then be communicated with Lenovo devices.